Jade plants are one of the most popular house plants to grow. They’re also one of the stealthiest, because many people don’t realize that cute little cutting is going to grow into large proportions. Cheerfully described as “assuming a tree-like shape as they mature,” they can live for a long time and grow into small trees or shrubs up to five feet tall. Jades (Crassula ovata) are easy to grow and nearly fool-proof, which is why we gardeners like to use them as gateway plants, to lure innocent friends into growing things. A succulent, they have fleshy, paddle-shaped, shiny leaves. They’re grown as foliage plants but do flower; the blooms are fairly small and occur on Jades 10 years and older. Several cultivars are available, including dwarf types that are ideal for bonsai. Once you’ve gotten yours, place it where it gets bright sunlight for at least four hours daily. They need day-time temperatures between 65 and 75 degrees Fahrenheit, and night-time temperatures between 50 and 55 degrees. During the winter months, protect plants from getting a cold nip from a chilly window by moving them a short distance back from the glass. Keep the soil moist, allowing the soil to dry slightly between watering. Jades are sensitive to having chronically wet soil and it often ends in root rot. But don’t let the soil dry too much, or your jade will complain about it by shedding its leaves or developing brown spots on them. If your plant requires watering more than once a day to stay moist, transplant it to a larger pot. Fertilize jade plants once every three to four months, but if the plant is recently repotted, wait four months before its first application of fertilizer. Liquid fertilizer is easiest to apply, never apply fertilizer to dry soil, because it will result in root injury. When repotting – this is best done on mature plants every two to three years – cut the jade back to help it re-established more quickly. Jade plants grow best in cactus mix soil with some added organic matter, or you can your own potting media by mixing one part sterilized organic soil, one part sphagnum peat moss, and three parts coarse sand. When you plant it into a larger pot, put some soil in the bottom of the pot and firm the soil around the old root ball. Water the soil thoroughly at first, and don’t water again until the soil dries out on top. Jade propagation is simple: take stem tip cuttings in spring and let them sit for five days to develop a callus over the cut end. Then root the cuttings and leaves in a moist sand/peat medium. This gives plenty of air for root development and a better chance of survival when transplanting. Roots that develop in water don’t take as well to being moved to potting soil as those that are rooted in sand or a sand/peat combination. Make room, gardeners, the season for houseguests has arrived. For these, rearranging the furniture and cleaning the windows is a must, and if you slip something extra into their water they won’t mind. Houseplants have regained their place on windowsills and counters, brought in from the patios and decks where they spent the summer. With a little understanding and prepping the house for their visit, your foliaged friends will be happy all winter long. When the plant is brought inside, do you stick it into an unused corner of the room or a place that needs a little more ‘meaning’? This is a common mistake, since those spaces are already empty of clutter. But don’t leave your plant huddling in a cold, dark corner — that’s the last place to put your houseplant. Think of your plant as royalty and choose a bright, sunny location away from drafts or heaters to place it. Move the furniture if you have to, to give your plants the pick of your home’s sunbeams. And get ready to clean. Houseplants are not overly demanding -they don’t care if the carpet is stained or the dishes need doing — instead, all they really want are good, clear windows. Light is critical for houseplants to thrive, yet because the amount of light needed varies from species to species, deciding where to put it can be a challenge. Check the plant tag for guidance on low (limited), medium (indirect or bright), or high (direct) light requirements and place the plant in the right spot, or add supplemental lighting. As a rule of thumb, low-level light rarely strikes the leaves and typically comes from north facing windows. Medium, or indirect light, is when light strikes the foliage for less than four hours per day. Through winter, medium light comes from east and west facing windows. High or direct light is as it sounds — light falls across the plant for a minimum of four hours daily. Plants that love these conditions should be placed in a south-facing window. Distance from the window plays a role in light levels also, so keep your plants within two feet of the window. Further away and light levels fall off rapidly. The dry interior of homes is particularly stressful to many of our tropical houseplants, which need more humidity than is present in houses. Although misting the foliage is one way to approach this, it doesn’t provide steady humidity and must be repeated throughout the day. An easier approach is to place a pebble tray filled with water under the plant. Simply take a tray and layer small stones evenly along the bottom, then fill with enough water to reach the top of the stones. Place potted plants on this tray, but take care that the water is not touching the pot itself. Most houseplants should not be placed in standing water. Refill the pebble tray often to keep the humidity levels even, and group plants closely together. Water vapor coming off the soil or clay pots adds to the air moisture of the happy group. Did the spiky showoff with brilliant pinks, purples, and reds catch your eye as it dangled from a hanging pot in the local greenhouse? If you’re the proud owner of a flowering cactus, you’ll find they’re carefree plants that add color to grey winter days. 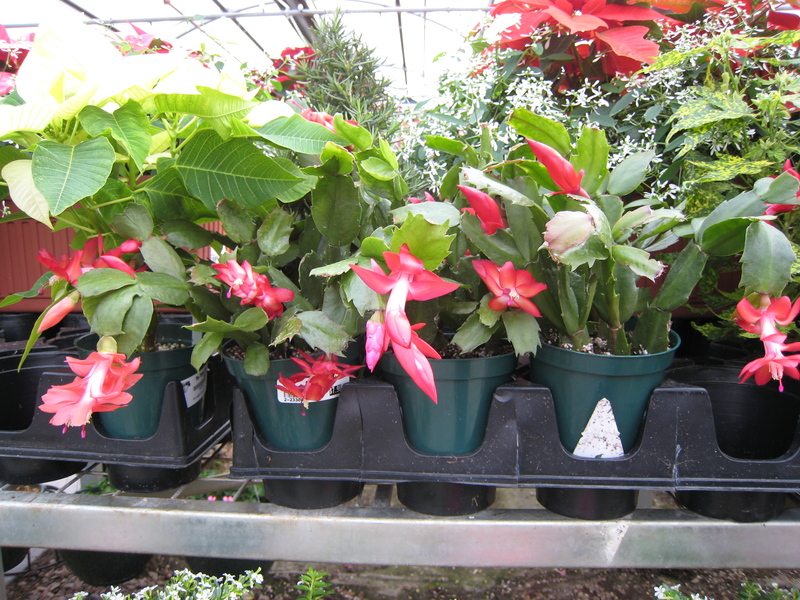 “The three cactus types, Thanksgiving (Schlumbergera truncata), with pointed “teeth” on the stems, Christmas (Schlumbergera x. buckleyi), with rounded tips, and Easter cactus (Hatiora gaertneri), are actually epiphytes. They live in trees in their native Brazil like orchids, but we grow them in pots here,” says Dr. Steve Newman, Greenhouse Crops Specialist with Colorado State University Extension. Although they’re cacti, they don’t grow dry; water yours weekly as the top inch of soil gets dry, and provide it with half-strength fertilizer each time you water. Every third week, give it clear water instead. “Because no one likes to stain furniture or carpeting, most people water without letting it run out of the bottom, and salts build up in the soil. Put the pot in the kitchen sink or bathtub every third watering and let water run though to flush salts out,” said Newman. The good news is that these sections are easy to root by placing them in a glass of water, and when the roots come out, pot up the section in sterile, everyday potting soil. While young, the small plant should be guarded against overwatering, so before you give it a drink, check the soil to be sure it’s not wet. A combination of cool temperatures and darkness is the cue these plants need to bloom, so move the cactus to a place with cool, 60-degree nights and only nine hours of sunlight daily. After approximately six weeks, Thanksgiving cactus will flower, and after two to three months, Christmas cactus blooms. The secret to eye-popping color is reducing water to the plant after flower buds have formed, says Newman. Water weekly until after the flower buds begin to swell, then cut back on the water slightly, letting the cactus dry out between watering without getting bone dry. Blossom color intensifies if the plant dries once flowers start, he said; many growers finish flowering plants this way during the last two to three weeks before they go on sale. Be aware that too dry will abort the flowers, so to avoid it going too far, get to know your cactus soil by inserting your finger in it up to the first knuckle, just before watering. Note that moisture level; as you dry down your cactus, check the soil to gauge when it’s a bit drier but not parched. “This is the best water meter ever invented,” says Newman, holding up his hand and indicating the tip of his index finger. As flowers unfold, move it out into the room where you want to display it, keeping it in bright, indirect light. A cool room is best; too much heat can cause flowers to fade and drop quickly, and if the leaves wrinkle, the plant is too dry or too warm. There’s no need to feed it during blossom, but after flowering, return the cactus to normal care of fertilizing at half strength and watering weekly. Like many people obsessed by their hobbies, gardeners aren’t good at recognizing when they’ve crossed the line from making polite small talk to giving too much information. At parties, an innocent question on what could be troubling houseplants gets them fired up and, waxing eloquent on the gestation of a fungus gnat, people think they need a life or are a complete lunatic. Either way, they end up alone talking to the plant. Gardeners, if you want people to talk to, take some advice: people are willing to listen to you explain that a houseplant’s lower leaves yellow and drop from over-watering. Or that leaves dry up and fall off or wilt when under-watered. But describe plants wilting from being too wet because roots need air as well as water leads to trouble. Gardeners know that the pot’s surface soil is usually dry, and that this involves pushing a finger into the soil deep enough to check – up to a knuckle or two. Passionately insisting that people need to give regular plant proctologic exams is a sure-fire way to get them to think you’re nuts. It’s worth it, though. Over-watering is the number one killer of houseplants. A few plants react differently from over-watering, such as Scheffleras. Their leaves become soft or develop black spots. Others, like Jades, will get leaf drop or spots from under-watering. Checking the soil is the best way to tell if a plant needs watering. Gardeners are safe talking about the weather, not discussing the affects of salts. Leaves yellow, often from the tips or edges in, when there is too much salt from soft (salty) water or fertilizer. Admonishing people to follow fertilizer directions because plants don’t benefit from a power drink, and they’ll start wishing they had one. When giving advice, give it cheerfully: if the tip burn is from salty house water, the only solution is to give the plant bottled water. Be prepared to be labeled a lunatic; only gardeners understand some plants prefer Evian. Never talk bugs. Alarm sets in when encouraging people to recognize the damage bugs do, such as making leaves a mottled yellow, leaving spider webs or sticky droplets. The sap feeders (spider mites, mealybugs, brown scale, and whiteflies) do this, and good control means looking closely to identify the bugs. A light but firm hand propelling people toward the bugs causes full-scale panic. Hosts start wondering why they invite gardeners. Try to soothe things by discussing control. Depending on the bug, repeated showering of the plant (spider mites), dabbing with alcohol (mealybugs and brown scale), rubbing them off (brown scale), or vacuuming them up (whitefly) is effective. Fungus gnats, the bugs that fly slowly about homes in winter, lay eggs in overly moist soil. One control for them is allowing the soil to dry slightly between watering. Another is placing a raw potato slice on the soil, which gnat larvae love, and after a few days they swarm it. Pick this up, throw it away, and replace with a fresh slice. After this advice there’s usually no one left nearby except other gardeners. Simply smile and tell them that the host can use Gnatrol, a natural product to get rid of fungus gnats while watering. Gardeners will nod at this wisdom, knowing it’s not as much fun as the potato slice. If your family and friends decided the best thing to give you was a plant this season, don’t sigh in resignation of having to care for another fussy houseguest. Most of the plants given at this time of year aren’t picky; they just need a little understanding. If you need a refresher on caring for your festive foliage, here’s a quick primer on how to have healthy, thriving plants well after the holidays are past. When the tag says “place in bright indirect light”, what this means: closely in front of – but not touching – east or west facing windows will give the plant the right light, or one foot away from a south facing window. For direct light, place it closer to the south window. For longest bloom, keep in a cool room, with nighttime temperatures of 55 to 60 degrees; during the day, set the thermostat between 65 to 68. These cooler temps will keep your plant’s blooms lasting longer. Feed with a balanced fertilizer. Most houseplant food is 20-20-20, but many winter bloomers need a half-strength solution until later in spring, when robust growth starts up again. Check the tag for feeding instructions before dosing the plant with too much fertilizer. 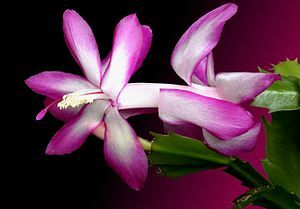 What: Christmas cactus (Schlumbergera bridgesii), a succulent, can be told apart from its cousin, the Thanksgiving cactus (Schlumbergera truncata), by its rounded “teeth” on the leaves (Thanksgiving cacti have pointed teeth). How: During bloom, keep in bright, indirect light in a cool room and let dry slightly between watering. If the leaves wrinkle and flowers fall, the plant is too dry or too warm. Feed: Once bloom is finished, fertilize once per month from April through October. What: Norfolk Island pines (Araucaria heterophylla), the small evergreen with soft foliage. How: These little trees, native to the South Pacific, will not survive our Colorado weather so keep them indoors in bright light and out of direct afternoon sun. Take care not to let it dry out in our low-humidity homes. Water when the top inch of soil feels dry, discarding water that collects in the catch pan. Feed: From April through June, use half-strength fertilizer twice per month. Feed monthly for the rest of the year. Tip: For healthy, bright foliage, mist with water twice per week for healthy, bright foliage. What: Christmas pepper (Capsicum spp.). How: Moist soil and full sun keeps the foliage lasting, but for fruit that’s glossy and plump, place this plant in a room with cool temperatures. This annual is a one-season wonder, finished when all the fruit drops off, so compost it when the display is over. Tip: If the oils from handling get into eyes or on skin, this pepper can be irritating. Choose a visible but out of the way area for this plant to keep kids and pets safe from its sting. What: Kalanchoe (Kalanchoe blossfeldiana), the succulent with stems of small, brightly colored flowers held above the leaves. How: Place in full sun for the remainder of winter, but when our sun becomes intense in late spring, pull it out of direct sun to a bright location to prevent leaf burning. Lightly damp to slightly dry soil is preferred by Kalanchoe; take care not to over-water or let it dry completely out. Feed: After bloom, fertilize once per month. How: Choose a spot with bright, indirect light and keep the soil moist but not soggy. Deadhead spent flowers soon after they fade, and continue to care for the bulb after blooming is finished – Amaryllis will rebloom year after year. Feed: After the shoot appears from the bulb, feed twice per month. This post previously appeared in the Boulder Camera, Longmont Times-Call, and Loveland Reporter-Herald. Getting back on the court after a few years off can make you wonder if you’ve still got game. When your show draws everyone’s attention, there’s a bit of pressure to make your return season your best. Toss in invitations for the glitterati of growing to come and assess your work, and even hardened veterans might worry. Cue the inspiring comeback music. After a five-year hiatus, Colorado State University poinsettia trails are back – big, bold, and in your face with color. With 80 cultivars packing the 3,200 square-foot greenhouse, the hallmark of the holidays are wall to wall with beauty that takes your breath away. And the time has come to rate those plants in the CSU Poinsettia Trails, Monday, December 7, when the public is invited to check out the crop and rank their favorites. Poinsettias, the number one holiday plant sold in America, is a $9.2 million dollar wholesale industry in Colorado, Newman says. Local growers provide retailers with thousands of the cheerful plants from Halloween through the end of the year. Treating plants with the same care in unbiased trials lets growers see how different varieties thrive under standard industry practices. “This isn’t a show where they’re going from booth to booth, seeing only those plants that are perfect,” he said. 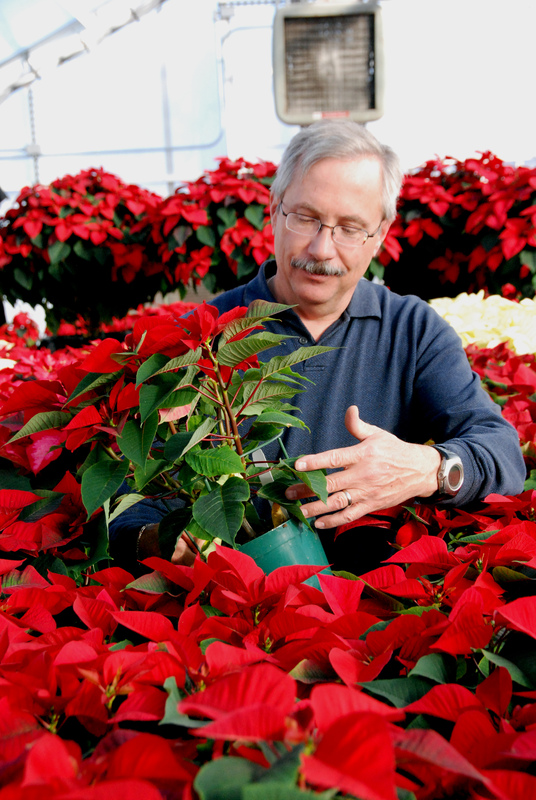 Growers need to know how that poinsettia will grow for them, if it’s finicky to raise, and when it will be in its prime. Though the trial isn’t paid for by plant breeders, the big poinsettia companies, like Ecke, Dummen, or Syngenta, send two-inch rooted plant cuttings to CSU in July for entry into the trial. Planted into 6-inch pots, the cuttings are cared for by Newman, Research Associate John Ray, and Floriculture graduate students. 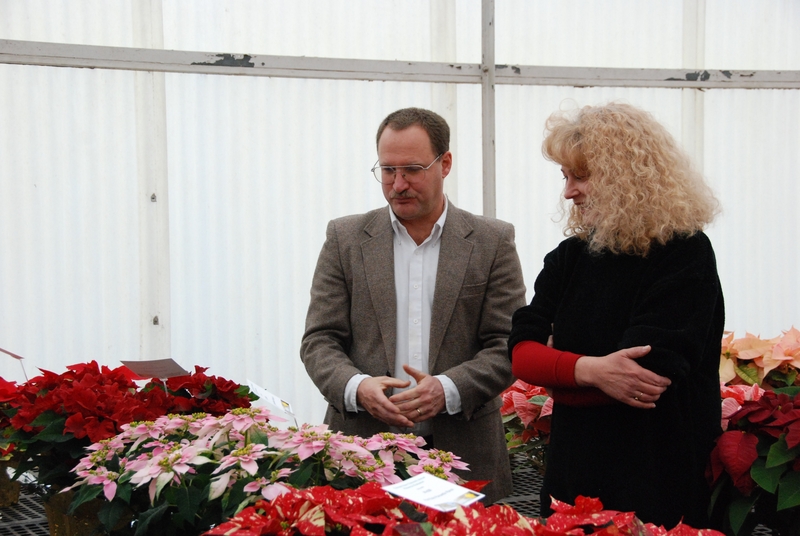 Costs are recouped from the sale of poinsettias during the public evaluation. As days begin shortening September 19th, the greenhouse crew covers windows at night to block out the glow of street lamps. This darkness stimulates the poinsettias to color up. The earliest plants are in full blush in five weeks; these jumpstart sales for the season. 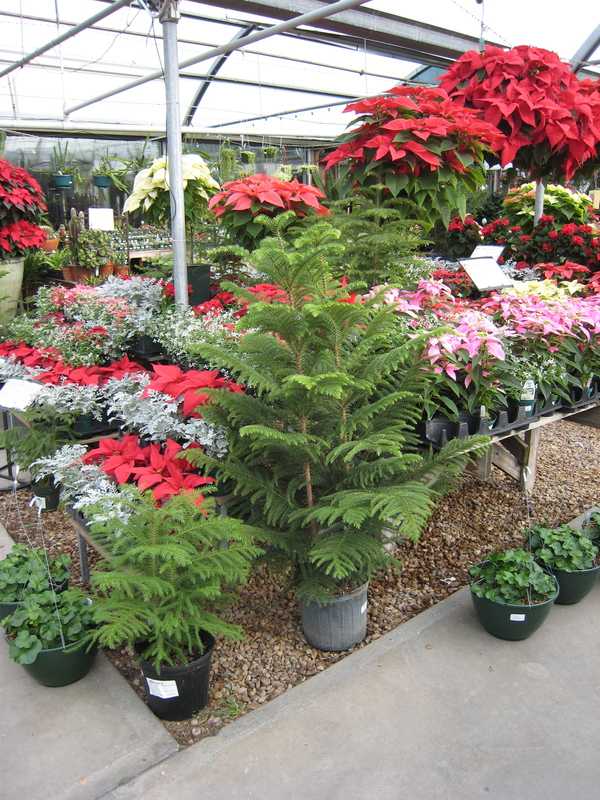 Later varieties are in full color by black Friday, the biggest single day for poinsettia sales. In plum, buff or seashell pink, there’s a poinsettia for you. For holiday haute décor, try speckles, crinkles, or rose-like doubles; even Broncos fans are in luck, with Orange Spice. Head on out to the trials early; the plants sell out fast. When: Monday, December 7, 9 a.m. to 3 p.m. Free admission. Where: W.D. Holley Plant Environmental Research Center, 630 W. Lake St., Fort Collins.